DON'T MISS - 8 signs you are about to become a victim of a property investment scam. I am not a fan of Facebook as it was originally intended for friends to stay connected, but is now a major marketing channel and is known for being one of the biggest originators of many different types of scams, including financial ones. I liken it to the "Wild West" as there is very little regulation or checking of advertisements and, of late, I am increasingly seeing promotions offering unrealistically high rates of return. There are very strict rules governing financial promotions but Facebook does not seem to enforce them. As this is "Business Risk Mitigation Week" 2019 on Property Tribes, I thought it worth highlighting this issue. P.S. If you would like to do your bit for community safe-guarding, please report these adverts when you see them on Facebook. You might be the only thing between someone losing life changing amounts of money or not! As a starter, Absolute ISA Limited was only incorporated last August (approx. 6 months ago), so minimal track record - https://beta.companieshouse.gov.uk/company/11512476. Both Director occupations are down as 'Entrepreneur'. Both directors are listed as IFAs under the registration for Copia Wealth Management Limited. They claim Absolute ISA is a trading name of CWML but there is a separate limited company (with 2 directors with the same name, address & birthday). They have the details for CWML on their website, but not AIL so is AIL actually associated with absoluteisa.co.uk? 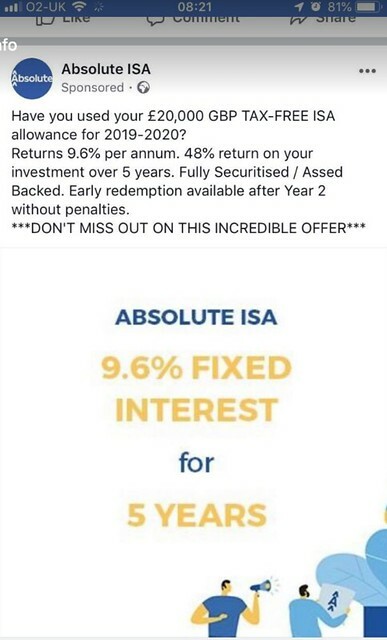 They claim the ISA is fixed interest but on the website they say 'Therefore, the returns are not guaranteed and you may not get back the full amount invested'. To be fair to the company they do make quite a big thing about capital being at risk - it is in a banner on every page of their website, on the FAQ page and a whole page about the risks - https://absoluteisa.co.uk/risks/. They are registered with the FCA. No IFISA is protected under FSCS (is any P2P lending?) so CWML are no worse than anyone else in this respect. CWML seem to be a reseller for a custom product from Hilbert Investment Solutions Ltd who I did a quick check on and they had a £500K turnover last year with audited accounts. 'Assed backed' did it for me! Almost subliminal in their spelling error! Spelling errors are an immediate red flag imho. If they can't be bothered to check spelling and grammar, then how are they going to look after your investment? Professional companies have accurate spelling and grammar on their website and all other communications. Interest isn’t compounded? £ and GBP, is this the correct format? Facebook really are a disgrace, this has been happening with scams and commercial data for years. But now it has morphed into politics and sinister globally connected extremists like Cambridge Analytica, the russian government and home grown extremists like Arron Banks. For example, Arron Banks' group promoted this fake video of Cairo, Egypt, before the 2016 referendum, telling people it was Germany and that they should be very, very scared. It was completely fake, a total lie, Facebook sold adverts and made money off of it, Arron Banks fooled and tricked 1,4 million people (who watched the video at the time), Facebook gets off scot free - the video is still live, no repercussions whatsoever. I think the world would be a better place if Facebook and Twitter were deleted. On a business level it's a hotbed for scams and gurus, on a personal level it's dumbing down the population with useless drivel. Agreed. They are unaccountable and evil.